Step One: Grab a Challenge Schedule! 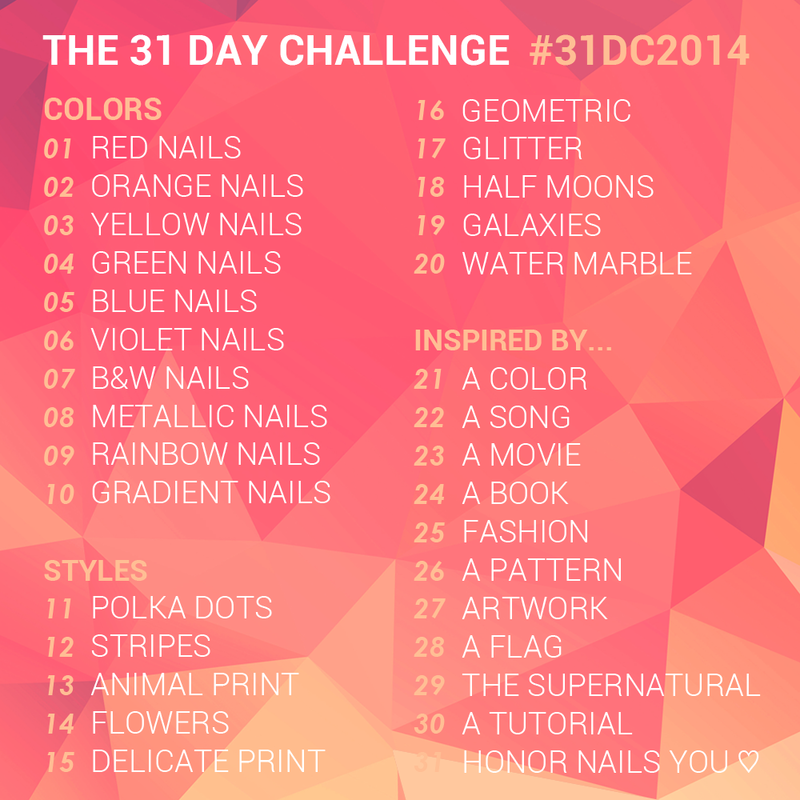 Here are the 31 Day Challenge prompts! Feel free to share, repost, upload to your blog, put on Instagram, etc. Click to enlarge. EDITED: In an effort to be more culturally sensitive, day 16 "tribal inspired" has been changed to "geometric." Why do you put yourself through this? I can't lie to you guys, the 31 Day Challenge is hard. Really hard. But the sense of accomplishment I feel at the end, the huge body of nail art work I produce, and the amount of practice it gives me, makes it all worth it. I do some of my best work under the pressure of the challenge, and it really gets me thinking creatively. The real question should be, "Why do you put your boyfriend through this?" No worries! You don't need a blog to participate. You can play along via social networks like Instagram, Facebook, Twitter, or Pinterest. 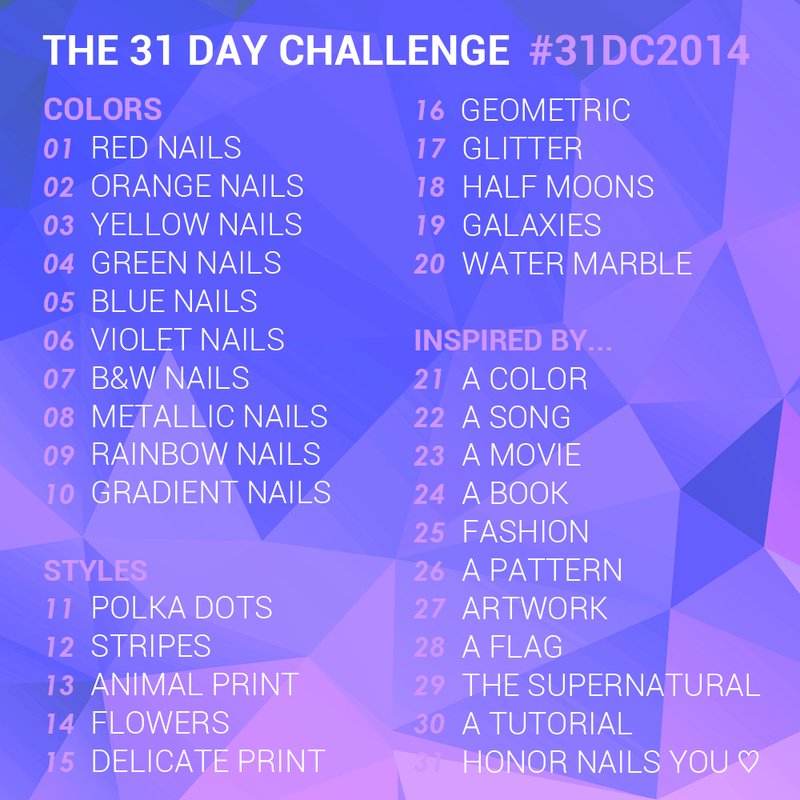 Just be sure to hashtag your work with #31DC2014. I've done this challenge for three years in a row now, and my nails have never shown any signs of trouble. If you are worried about your nail health, try non-acetone remover or fortified acetone, and always remember to moisturize your nails afterwards with cuticle cream or cuticle oil. No. 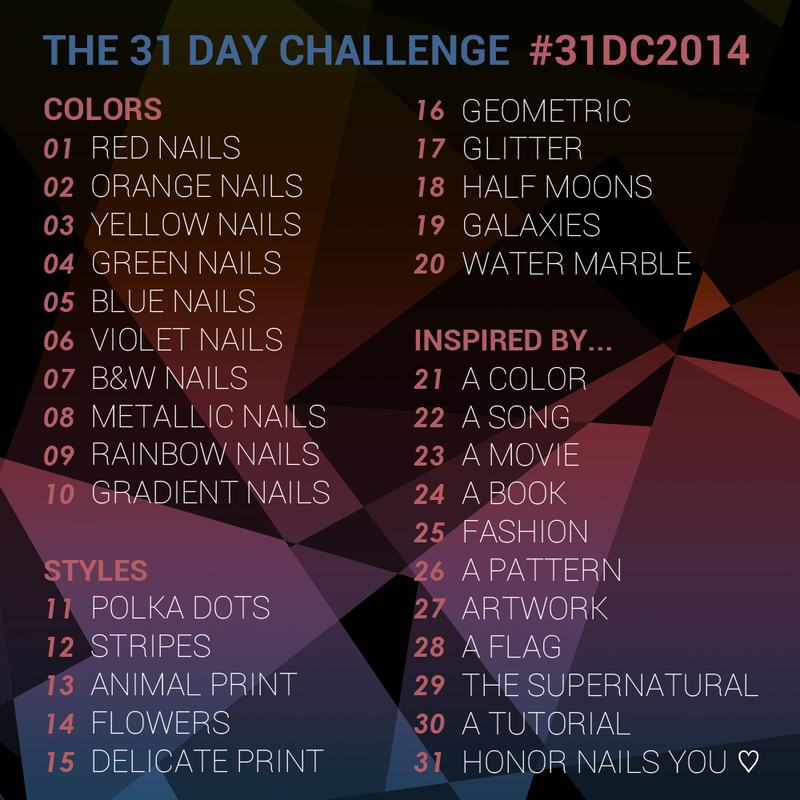 However, you can use the official hashtag #31DC2014 to share your work. I always begin on September 1st. There are no rules to this, truly! One thing that I do encourage, though, is that you take the time to go around and comment on your fellow nail artists' work during the duration of the challenge. Part of what makes this challenge great is the sense of community that comes from taking it on together. Use the hashtags to browse everyone's work and discover some new artists! Will you be joining in? Personally, I say BRING IT ON! I haven't done a challenge in awhile, but I might try it...eek! Hi! I'm from Argentina, this challenge seems very interesting, but if I do it in september it will be very, very hard because i have to study; but I really liked, so I'm going to do it in december :) I promise jaja, kisses from Argentina! Awesome to see this up again! Not sure if I will be participating yet but I'm going to bookmark this page and decide soon. I'm part of a collaborative challenge already but I'm really interested in doing this, like you mention, to improve and push the boundaries of nail art/creativity. But then I thought this is not a very good timing for me right now, when I'm in the middle of a major change in my life, definitely will do it before year's end when we're settled in our new home and I get to be a stay at home mom, yaaay!! BTW, I'm loving your roundups, specially the "glittery Edward". Understandable! I'm sure you'll enjoy it if you give it a try. I am so in this time! I'm so glad you did a FAQs post this year. 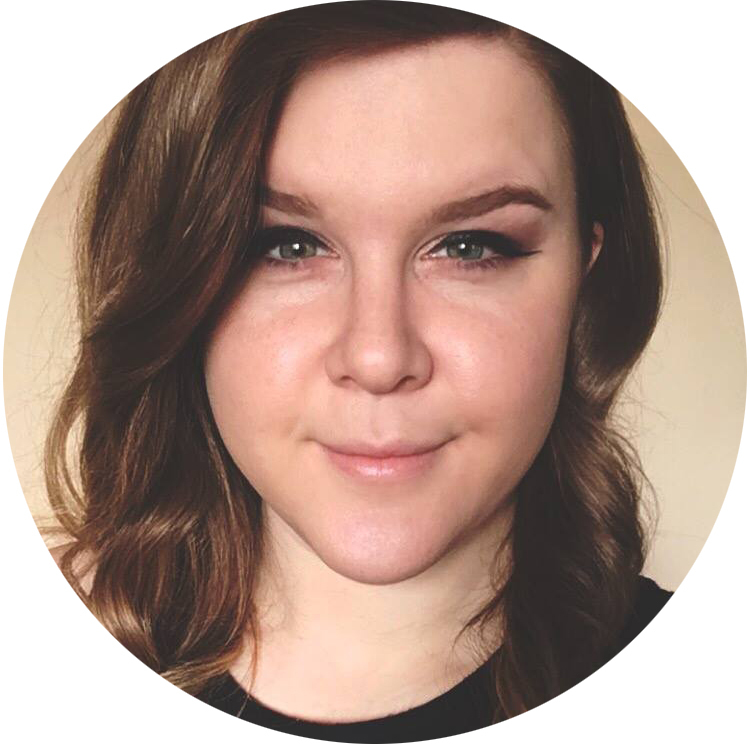 Last year I had just started blogging and I was pretty overwhelmed and had a lot of questions. I am soo glad I participated when I did because my skills grew so much faster than I could have expected. I have high hopes for the manis I produce this year! Like you said.. BRING IT! I loved having the inlinkz last year but I guess I'll just have to take to IG to see the other offerings. I've never seen anyone do them out of order, but I suppose you could! This looks like so much fun! I really want to do it, but my boyfriend swears I'll get too frustrated and give up by the third day haha. Maybe I can start practicing during these next few days. Is there a post that has all the pictures from the other times you did the challenge? I didn't even realize that September was approaching so quickly! I know a few nail bloggers do it in September and I really wanted to follow along with all of you ladies, but since so much is happening for me that month, I did it in July instead. And I actually managed to do it too! You're right, it is very hard, but undoubtedly worth it. I'm hoping to do it in September next year though! I hope everyone participating this time around has fun with it! I think I remember Cathy from More Nail Polish having one last year? Nice, congratulations on finishing it! Yay, can't wait to see what you do! :) Thanks for the kind words about the FAQ. You'll enjoy it I'm sure! I'd loved participating last year, and it really sparked my love for nail art! I'm absolutely joining in again this year! I completed last year and it was a blast! I'm totally in again this year!!! Yay glad to have you! SO HAPPY you changed tribal to geometric. <3 Looking forward to it! Ima do some ahead of Sept and just hold onto them and post them throughout the challenge -- I'm a teacher, so I'm often in the same situation you are! This year I defenitely want to join! I wish I had the time to do this, but the prompts will help when I'm having nail block lol. Can't wait to see your creations!! Well I'm happy to have you on board in whatever capacity you are able to do! A huge huge part wants to do this, but I is scared. 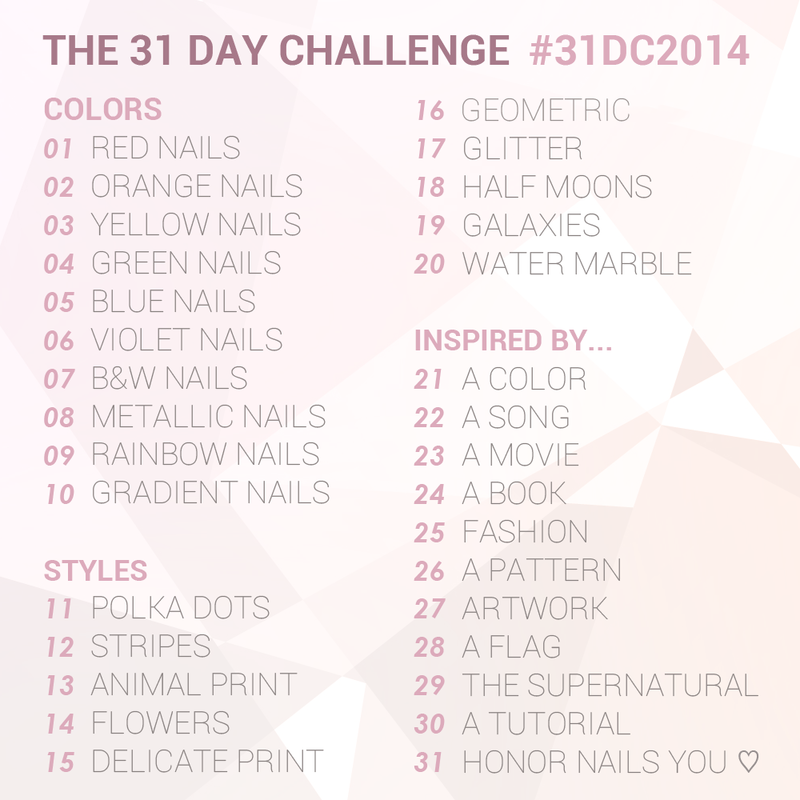 I'm gonna have to think about it because I've always wanted to do a 31 Days Nail Challenge. It's intense but worth it! Oh man, I am so tempted to do this! I always love when September comes around because you guys do such awesome work. I think I just need to go for it! Oh my GOD! You made my heart beat faster now. I have participated of the 31DC2013, but couldn't manage to do it in 31 days. I have two questions for you though: Do you paint both hands every day or just the left one? How do you manage to do it in 31 days having a full-time job? I agree!! Go for it! I always put at least something on my other hand, not always a full copy but sometimes a simplified design. As for doing it with a job, it's very tough. But it's important to me, so I make it work! And I have a lightbox, so I can shoot at night. I have a lightbox tutorial on here if you're interested! I have to admit that last year's challenge pushed me to practice more and I'm very proud of how much I have improved my skills, even though it was only once a week. I have one of those old slide projectors with a very good white light, but don't have a lightbox yet. I'd love to check your tutorial. Maybe I get to build one for me. Hubby just bought a macro lens for one of his Canons and allowed me to play with it, so that's already something to encourage me. Building a lightbox is super easy -- you should definitely check out the tutorial! I hope you're able to join us, but I understand if you can't! I'm so excited to try the challenge for the first time! I've already starting some brainstorming for manis! I can't wait to see everyone else's designs. The FAQ is so helpful! I'm a teacher, too! My students always comment on my nails, so it will be interesting to see what they say about them during this challenge! I started the one last year but failed horribly after just a few days lol going to try it this year. Maybe tell myself if I complete it, I'll award myself with a little shopping spree haha . I really want to do this. I don't know if I'll get the time to do something every day but I really wanna try. I hope it will help me get better. I'm just a bit scared of the watermarble day because my only attempt was a huge failure but maybe I'll cheat and free-hand something that looks like watermarble :p. I love the pretty lists you made. I have a question though, I get how to hashtag something on social media, but how do I do it on blogger? There's no way to hashtag on blogger. You can add it as a label but that's not really the same. I have a silly question... Do we have to complete the challenge on our own hands/fingers? Or can we for example use a nail spindle, nail sticks or even a nail training hand? And just do an example of 1, or does it need to be a "set"? Cool! Glad to have you on board! I'm doing this for the first time tomorrow i can't wait to finish it!!! Crap, September is a real busy month for me, but every year I would taking part. It's ok if I shall join this challenge in October? Yes, you can do it whenever you want!